The end of the year is filled with many celebrations for the Class of 2019. The intent of this newsletter is to inform you of important dates, times, and details related to the end of the year events. Please read over this information carefully, check the website for updates, and stop by the Main Office with any questions. Our graduation ceremony will be at the Northern Illinois University (NIU) Convocation Center in DeKalb, Illinois on Wednesday, May 22. The NIU Convocation Center seats 10,000 people so tickets will not be needed for BHS graduates, families, or friends! BATV will continue its tradition of streaming the Graduation Ceremony. Please check the BATV website (www.mybatv.com) for details about the streaming. Students must fulfill all BPS graduation requirements. Attendance and appropriate behavior at the graduation rehearsal on Tuesday, May 21, at 9:15 a.m. in the Batavia High School gym is required. Seniors must be in good standing in order to participate in the graduation ceremony. Discipline referrals, participation in pranks, or other conduct violations will be considered in determining if a student is in good standing. All detentions must be served prior to graduating. All class, library, activity or athletic obligations and fines must be cleared by 2:45 p.m. on Tuesday, May 14. Lockers must also be emptied by this time. Arrival: The commencement ceremony will begin promptly at 7:00 p.m. on Wednesday, May 22. When you enter the Convocation parking lot, please use entrances 2 – 5. Entrances 2, 3 & 4 are for express check-in – no purses or bags will be allowed if using these entrances. Doors open at 6:00 p.m. for graduates and guests. Graduates should check in no later than 6:20 p.m. in the auxiliary gymnasium which is located in the lower level by entrance #5. (6:00 p.m. – 6:15 p.m. may be used to take pictures). Guests may proceed to the main arena and find seats. General seating is available for guests, and handicapped accessible seating is available. NIU has requested that you do not reserve or save seats. Directions from I-88: Exit onto Annie Glidden Road. From Annie Glidden Road, turn left (west) onto Lincoln Highway (Route 38) to the Convocation Center entrance. Parking: From the main entrance on Lincoln Highway (Rt. 38), parking attendants will assist you in parking in one of the lots. There is no fee for parking for this event, and there is ample parking for the BHS graduation. What to Bring and What NOT to Bring: NIU staff will check all bags prior to entry into the Convocation Center. NIU prohibits outside food and beverages, large bags or backpacks, noisemakers, balloons, signs, posters, strollers or aerosol hair spray. Graduates should not bring valuables with them to the staging area since these items cannot be secured during the ceremony. Graduates should iron their gown prior to arrival and CARRY THEIR GOWN into the Convocation Center. Graduates will be allowed to put on their gowns in the staging area after they have been checked in by Batavia staff. Honor Stoles: Students graduating with honors will wear highly visible stoles that signify their accomplishment. The stoles will be distributed during graduation practice on May 21. Graduates must bring their stole to the graduation ceremony. Minimum GPA requirements are 3.5 for a red stole, 4.0 for a gold stole, and 4.375 for a white stole. We are requesting that students drive with their families to DeKalb. For your safety, we are not allowing students to drive to the ceremony together. We know that students may be distracted due to the excitement of the evening, and riding to the ceremony with other students may increase their distractions. We will have staff members in the parking lot ensuring that this safety rule is followed. If you have transportation issues/concerns, please contact JoAnne Smith @ joanne.smith@bps101.net. Graduation Attire at the Ceremony: Graduation from Batavia High School is celebrated at a formal ceremony. Students must wear dress clothes under their graduation gowns. Males usually wear a collared dress shirt, dress slacks, and dress shoes. Females usually wear dresses and formal shoes (flats or heels). Gym shoes, jeans, flip flops, shorts, and other casual clothes are not allowed. If students are not properly dressed, they will not be allowed to participate in the ceremony. Graduates are not allowed to have artwork or decorations on their caps or gowns. The only acceptable items are the honor stoles and cords provided by the school. Graduation Decorum: Graduation from high school is a source of individual joy and celebration, and the actual ceremony is a formal public gathering of friends and family. We maintain high expectations for appropriate behavior during the ceremony. These expectations will be discussed with the seniors at graduation rehearsal. Students whose behavior is deemed inappropriate during the ceremony will be removed from the ceremony by staff. If a student is removed from the ceremony, their family will be contacted and asked to leave the Convocation Center. Guests in the audience are asked to withhold applause during the presentation of diplomas until the end of the presentation. Diplomas: Students will be given a diploma cover during the presentation of diplomas. The official diplomas with the student’s name will be distributed after the ceremony. Photography: BHS has arranged for professional photographs to be taken by Grad Images during the commencement ceremonies as each student receives a diploma cover. Information about purchasing these photos will be sent to the graduates from Grad Images. 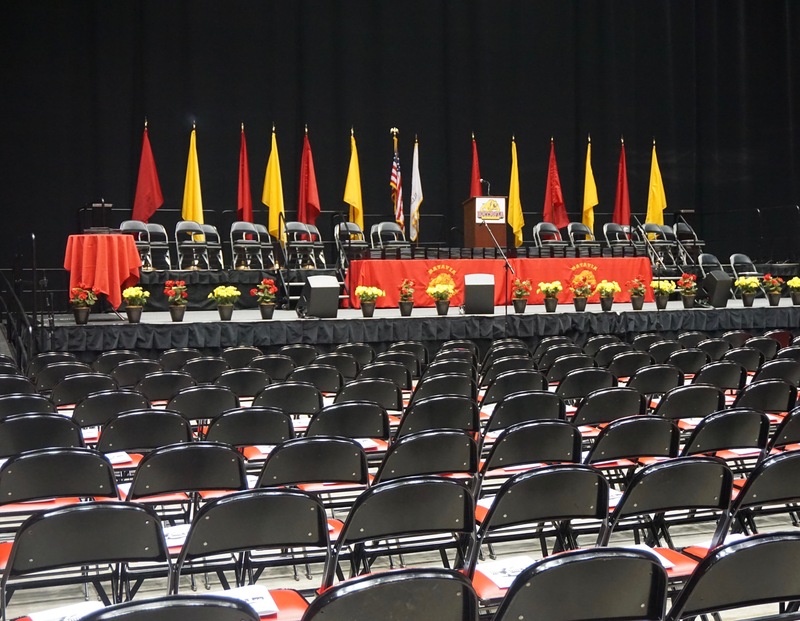 To assure that all graduates, their families, and friends may enjoy and view the ceremony, we ask that guests are considerate of one another and not leave your seat to take photographs – they are welcome to take additional photos from their seats. For safety purposes, guests will not be allowed to stand along the rails or in the aisles to take pictures. Cell phones: BHS requests that you keep your cell phones silent throughout the ceremony. Guests are asked to remain in their seats until all graduates and participants in the recessional have exited. Graduates will proceed back to the auxiliary gym where they are to drop off their rental gown and obtain a ticket. After the gown has been returned, they will proceed to their original assigned table, hand in their ticket and pick up their diploma. Graduates may keep the cap and the tassel. Please note: This is a rental graduation gown. If you did not order your cap and gown, please call Herff Jones at 815-756-4743 or you may email them at www.herffjonesil.com. Teachers will inform all students how their final grade will be assessed. For some courses, this includes a traditional final exam and for some courses it may include a performance assessment. There will not be a specific schedule for senior finals for second semester. All assessments for seniors will be given in their normal class time. Some courses may give a summative assessment in the final days of school. This year’s Senior Honors Recognition Night will be at the Batavia Fine Arts Centre on Wednesday, May 1, at 7:00 p.m. To be included in the ceremony, students must turn in the form (click here to access) so the Counseling and Advising staff can plan for the ceremony. Please complete the form on the last page of this newsletter and return to the Counseling and Advising Office by 3:00 p.m. on Friday, April 19. Students can audition for one of eight speeches during graduation. An informational meeting will be held in D103 on Tuesday, March 5, at 2:45 p.m. The Senior Breakfast will be held in the cafeteria on Tuesday, May 21, at 8:00 a.m. Tickets prices will be announced at a later date. You are strongly encouraged to attend. The Senior Class Panoramic Photo will be taken in the gymnasium prior to rehearsal on Tuesday, May 21, at 9:00 a.m. The photo will be shipped directly to your home. Order forms will be available a week prior to the picture and can be picked up in Student Services, the Counseling and Advising office and the Main office. They will also be available the day of the picture. Families can choose to purchase graduation announcements from Herff Jones. If you did order announcements, Herff Jones will be here in March during lunch periods – Herff Jones will send out an announcement and it will be posted on our website. Rental cap and gowns are to be ordered from Herff Jones and turned in after the ceremony. You may keep the cap & tassel. Herff Jones will communicate details about these purchases to the families. Herff Jones will be delivering the caps & gowns mid April during lunch periods. If you are unsure if you ordered your rental cap and gown, you may contact Herff Jones directly at highschool.herffjones.com or you may call them at 815-756-4743. Seniors will be emailed a Google form to fill out their final transcript request. Do not enter these requests into Naviance. All colleges require immunization records before enrolling. Every senior will be given a copy of their immunization records at the graduation rehearsal. Please check your university requirements and discuss with your doctor the need for the meningococcal vaccine. Batavia Access Television is proud to be covering the 2019 Batavia High School Graduation Ceremony. If you would like to purchase copies of this event on DVD, please send a check for $25 (per copy) made out to BATV, along with your mailing address to: BATV, P.O. Box 731, Batavia, IL 60510. All seniors are required to return their Chromebooks. Early graduates must return by December 21, 2018 to the Chrome Depot. All other graduates will receive an email in late spring about return procedures. The BHS Key Club will send information to senior parents about the ‘Hug & Kiss a Senior’ program. These will be distributed at graduation practice. Graduation yard signs can be purchased on Powerschool. These need to be purchased by March 15 in order to ensure timely delivery. All class of 2019 BPS accounts will be shut down on June 30th. An email with specific directions on saving data will be sent to your BPS email account in the spring. Transportation Students will arrange their own transportation to and from Bobak’s. BHS will not be providing transportation. Annually, BHS parent volunteers host a Post Prom event at Funway in Batavia. The event begins after prom, and the cost of the event is included in the prom ticket. Juniors and seniors who are not attending prom can attend post prom if they purchase a ticket. More details will be posted on the BHS website.